The Global Volcanism Program has no activity reports for Nevado de Toluca. The Global Volcanism Program has no Weekly Reports available for Nevado de Toluca. The Global Volcanism Program has no Bulletin Reports available for Nevado de Toluca. Nevado de Toluca, México's fourth highest peak, rises above the Toluca basin about 80 km W of Mexico City. 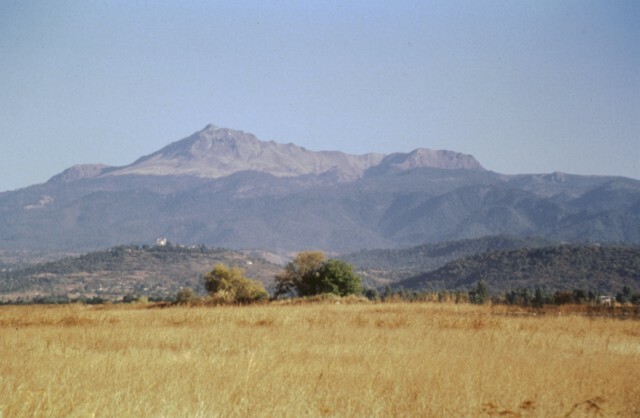 The broad, complex andesitic-dacitic stratovolcano, also known by the Nahuatl Indian name Xinantécatl, has a 1.5-km-wide summit crater open to the east. A large dacitic lava dome in the crater separates two lakes, known as the lakes of the Sun and Moon. 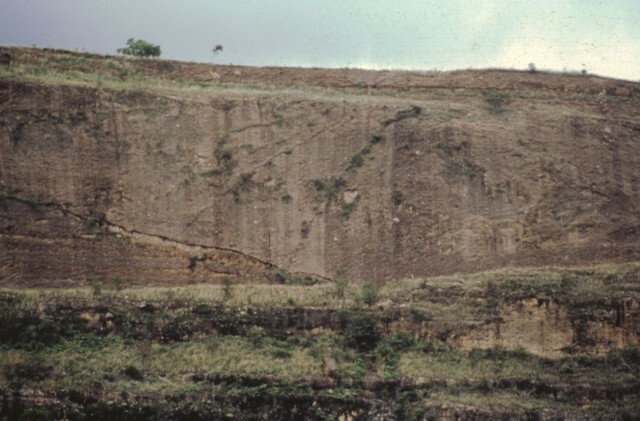 At least three major edifice collapses during the Pleistocene produced large debris-avalanche and lahar deposits that affected broad areas below the volcano. Four major explosive eruptions during the late Pleistocene produced widespread ashfall and pyroclastic-flow deposits at about 36,000, 21,700, 12,100, and 10,500 years ago (uncalibrated 14C), producing the Ochre and the Lower, Middle, and Upper Toluca Pumice deposits, respectively. Recent work has revealed evidence for at least one Holocene eruption, about 3300 years ago, that produced pyroclastic flows and surges. Arce J L, Cervantes K E, Macias J L, Mora J C, 2005. The 12.1 ka Middle Toluca Pumice: a dacitic plinian-subplinian eruption of Nevado de Toluca in Central Mexico. J. Volcanol. Geotherm. Res., 147: 125-143. Arce J L, Macias J L, Vazquez-Selem L, 2003. The 10.5 ka plinian eruption of Nevado de Toluca volcano, Mexico: stratigraphy and hazard implications. Geol Soc Amer Bull, 115: 230-248. Armienta M A, De la Cruz-Reyna S, Macias J L, 2000. Chemical characteristics of the crater lakes of Popocatepetl, El Chichon, and Nevado de Toluca volcanoes, Mexico. J. Volcanol. Geotherm. Res., 97: 105-125. Bellotti F, Capra L, Groppelli G, Norini G, 2006. Tectonic evolution of the central-eastern sector of Trans Mexican Volcanic Belt and its influence on the eruptive history of the Nevado de Toluca volcano (Mexico). J. Volcanol. Geotherm. Res., 158: 21-36. Bellotti F, Capra L, Sarocchi D, D'Antonio M, 2010. Geostatistics and multivariate analysis as a tool to characterize volcaniclastic deposits: application to Nevado de Toluca volcano, Mexico. J. Volcanol. Geotherm. Res., 191: 117-128. Bloomfield K, Valastro S, 1977. Late Quaternary tephrochronology of Nevado de Toluca volcano, central Mexico. Overseas Geol Min Res, 46: 1-15. Cantagrel J-M, Robin C, Vincent P, 1981. 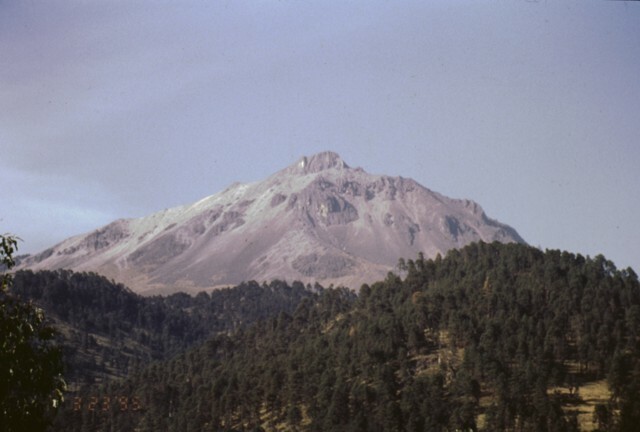 Les grandes etapes d'evolution d'un volcan andesitique composite: exemple du Nevado de Toluca (Mexique). Bull Volcanol, 44: 177-188. Capra L Carreras L M, Arce J L, Macias J L, 2006. The Lower Toluca Pumice: a ca. 21,700 yr B.P. plinian eruption of Nevado de Toluca volcano, Mexico. In: Siebe S, Macias J-L, Aguirre-Diaz G J (eds) Neogone-Quaternary continental margin volcanism: a perspective from Mexico, Geol Soc Amer Spec Pap, 402: 155-173. Capra L, Macias J L, 2000. Pleistocene cohesive debris flows at Nevado de Toluca volcano, central Mexico. J. Volcanol. Geotherm. Res., 102: 149-168. Capra L, Norini G, Groppelli G, Macias J L, Arce J L, 2008. Volcanic hazard zonation of the Nevado de Toluca volcano, Mexico. J. Volcanol. Geotherm. Res., 176: 469-484. Garcia-Palomo A, Macias J L, Arce J L, Capra L, Garduno V H, Espindola J M, 2002. Geology of Nevado de Toluca volcano and surrounding areas, central Mexico. Geol Soc Amer Map & Chart Ser, MCH080. Garcia-Palomo A, Macias J L, Garduno V H, 2000. Miocene to Recent structural evolution of the Nevado de Toluca volcano region, central Mexico. Tectonophysics, 318: 281-302. Macias J L, Garcia A, Arce J L, Siebe C, Espindola J M, Komorowski J-C, Scott K, 1997. Late Pleistocene-Holocene cataclysmic eruptions at Nevado de Toluca and Jocotitlan volcanoes, central Mexico. Brigham Young Univ Geol Studies, 42(1): 493-528. Macias J L, Garcia A, Arce J L, Siebe C, Espindola J M, Komorowski J-C, Scott K, 1997. Late Pleistocene-Holocene cataclysmic eruptions at Nevado de Toluca and Jocotitlan volcanoes, central Mexico. IAVCEI Puerto Vallarta, Mexico Plenary Assembly, Excursion no. 14 Field Guide, p. 1-63. Martinez-Serrano R G, Schaaf P, Solis-Pichardo G, del Sol Hernandez-Bernal M, Hernandez-Trevino T, Morales-Contreras J J, Macias J L, 2004. Sr, Nd and Pb isotope and geochemical data from the Quaternary Nevado de Toluca volcano, a source of recent adakitic magmatism, and the Tenango volcanic field, Mexico. J. Volcanol. Geotherm. Res., 138: 77-110. There is no Deformation History data available for Nevado de Toluca. There is no Emissions History data available for Nevado de Toluca. 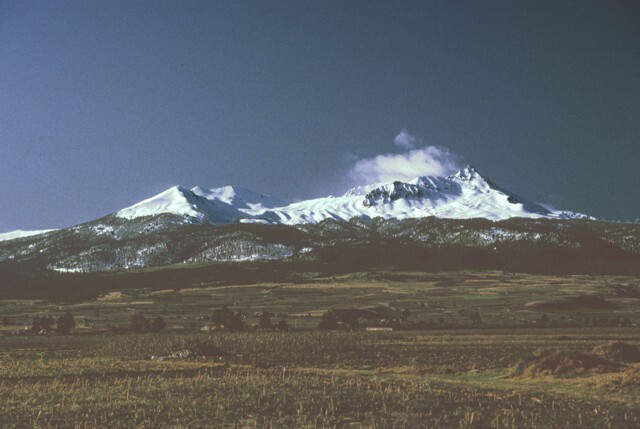 Nevado de Toluca, seen here from the NW, is México's fourth highest peak. It is a broad, complex stratovolcano with a 1.5-km-wide summit crater that is open to the east. A dacitic lava dome in this crater separates two lakes, known as the lakes of the Sun and Moon, which can be reached by the road seen ascending diagonally across the snow-covered slopes. Much of the activity of Toluca volcano ended in the Pleistocene, but recent work has revealed evidence for an explosive eruption about 3300 years ago. 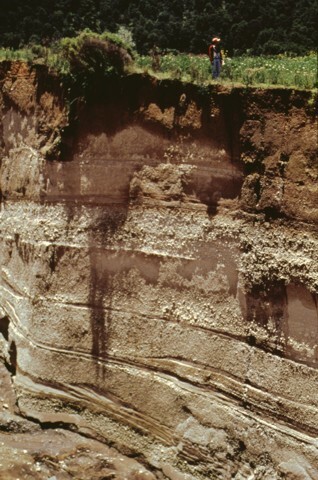 Stream erosion exposes an outcrop of the Upper Toluca Pumice, which orignated during the last large plinian eruption of Nevado de Toluca volcano some 10,500 years ago. This eruption produced a sequence of pyroclastic-flow, pyroclastic-surge, and pyroclastic-fall deposts. Note the person at the top of the outcrop for scale. The Upper Toluca Pumice was distributed primarily to the NE and is found over much of the Valley of México. 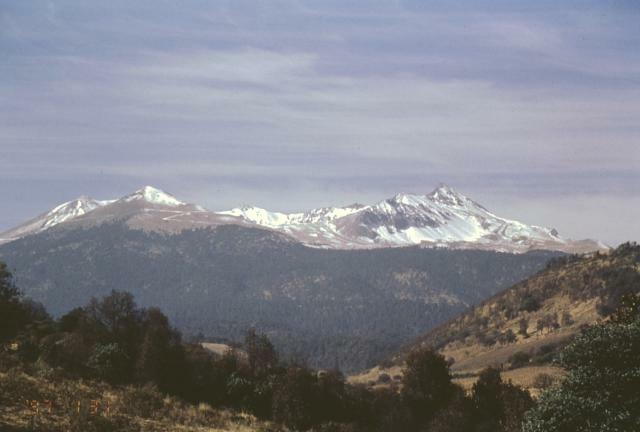 The upper flanks of the dominantly Pleistocene Nevado de Toluca volcano consist primarily of dacitic lava flows that are well exposed above the tree line at 4000 m. This view shows the western flanks of Pico del Fraile, the high point of the andesitic-dacitic volcano on the SW rim of the horseshoe-shaped summit crater. The summit crater and flanks of the volcano have been extensively modified by glacial erosion. The rounded dacitic central dome El Ombligo is the youngest feature in the summit crater of Nevado de Toluca volcano. This dome structure separates the 4200-m-high volcano crater floor into two lakes, the largest of which in the SW side of the crater (left) is called Lake of the Sun. The other lake, known as the Lake of the Moon, lies beyond the right side of the dome in this view, which shows the road leading into the summit crater at the right. Divers have recovered incense offerings, statues of the rain god, and carved sticks and jade in the lake. 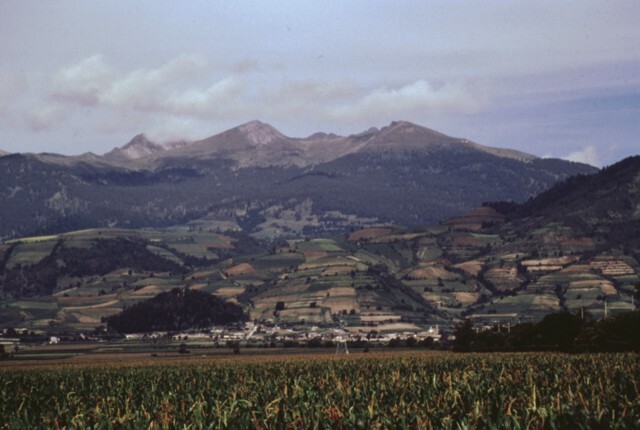 From the south, a panoramic view clearly shows the broad truncated shape of Nevado de Toluca with its highest peak El Fraile at the left. The volcano is also known by its Nahuatl Indian name, Xinantécatl, which means "Naked Man." The volcano's truncated morphology is due in part to explosive eruptions, large slope failures, and glacial erosion. 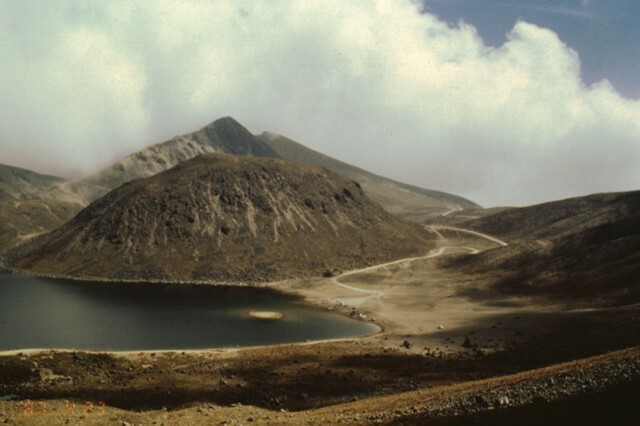 Nevado de Toluca lies 80 km WSW of Mexico City. 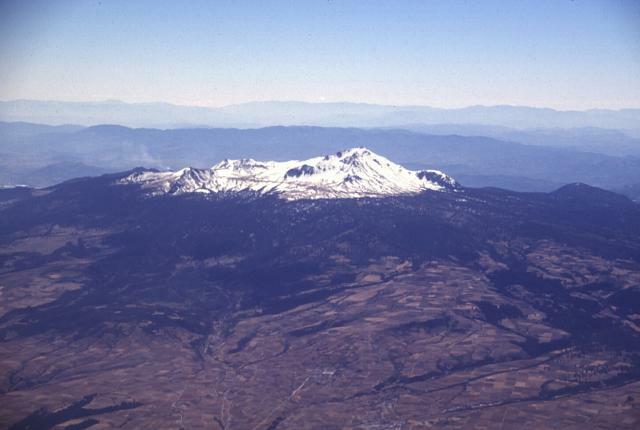 The horseshoe-shaped summit crater of Toluca, rising above the east-flank town of San Antonio Balderas, is open to the east. Block-and-ash flows from late-Pleistocene eruptions about 40,000 and 28,000 years ago blanket this and other flanks of the volcano, covering an area of 630 sq km. An exposure on the south flank of the volcano shows two debris-flow deposits transformed from original flank failures of the volcano during the late Pleistocene. Debris-avalanche and lahar deposits cover a broad area of about 500 sq km south of the volcano. Photo by José Macías, (Universidad Nacional Autónoma de México). The southern flanks of Nevado de Toluca volcano are seen here from near the town of Coatepec, with the summit peak of El Fraile at the left. 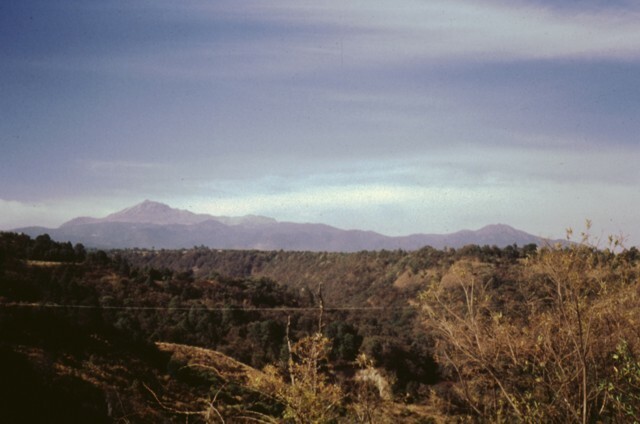 The photo clearly shows the tree line on Toluca at about 4000 m. Massive block-and-ash flows about 37,000 and 28,000 years ago extended down the southern flanks to beyond the current location of Coatepec town. The hills in the foreground represent semi-vertical faces of faults forming a complex set of grabens and horst structures. Photo by José Macías, 1997 (Universidad Nacional Autónoma de México). Nevado de Toluca, México's fourth highest peak, is a broad, complex stratovolcano with a 1.5-km-wide summit crater that is open to the east. The northern slope of the volcano rises here above the Zacango valley with a thin covering of summit snow, from which the name Nevado is derived. Two violent pelean eruptions during the late Pleistocene produced widespread ashfall and pyroclastic-flow deposits. More recent work has revealed evidence for at least one Holocene eruption, about 3300 years ago. 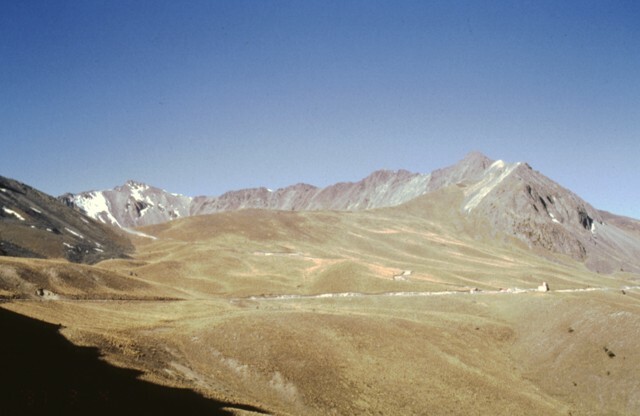 The far western crater rim of Nevado de Toluca volcano is seen here on the horizon from the NE. The road into the crater cuts across the center of the photo below the low, smoother northern crater rim. The smooth surface of the northern flank consists of a blocky dacitic lava flow that was modified by extensive Pleistocene-Holocene glacial erosion. Deposits of rock glaciers and moraines are abundant at Toluca. 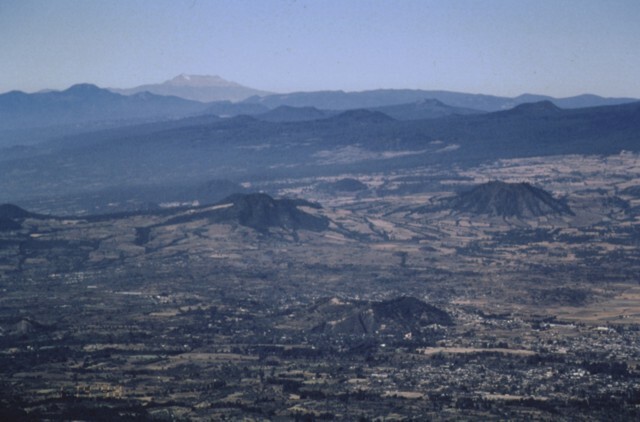 Cones of the Chichinautzin volcanic field in the foreground and middle distance are seen here in a telephoto view looking to the west from Popocatépetl volcano. The large flat-topped volcano on the left-center horizon is Nevado de Toluca. The broad Chichinautzin volcanic field covers a 90-km-wide area south of the Valley of Mexico between the base of the Sierra Nevada (containing the twin volcanoes of Popocatépetl and Iztaccíhuatl) and the eastern flank of Nevado de Toluca volcano. Photo by José Macías, 1998 (Universidad Nacional Autónoma de México). Nevado de Toluca is seen here from the NW just after a winter snowfall. Pico del Fraile, the 4680-m-high summit of the volcano, is at the right. The broad andesitic-dacitic stratovolcano is México's fourth highest volcano. Late-Pleistocene pelean block-and-ash flows and plinian pumice eruptions have affected all sides of the volcano. Photo by Paul Wallace, 1992 (University of California Berkeley). Large Eruptions of Nevado de Toluca Information about large Quaternary eruptions (VEI >= 4) is cataloged in the Large Magnitude Explosive Volcanic Eruptions (LaMEVE) database of the Volcano Global Risk Identification and Analysis Project (VOGRIPA).